are free of emulsifiers, preservatives, perfume, mineral oils, silicones, dyes and amines. The number of people with problem skin is constantly on the increase. They need a dermatology-oriented professional advice and above all a skin care concept which is adjusted to the individual skin condition. The name dermaviduals® stands for products which support preventive care to avoid problem skin. They are able to provide adequate care for already existing problem skin and to significantly improve its condition. 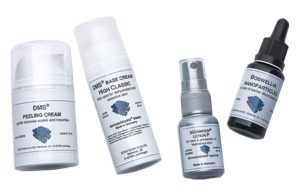 dermaviduals® products are also highly recommended for the care of normal and young skin. They optimally maintain the natural skin barrier and prevent the premature skin aging process. dermaviduals® products with DMS® (Derma Membrane Structure) resemble the membrane structure of the natural skin barrier. This corresponds to the principles of corneotherapy i.e. the physiological criteria to maintain a healthy skin.